After a nice theoretical post, let’s get down to the nitty gritty. How can we get a tangible look into how someone perceives his personal space? How can we determine inconsistent perception of space interfering with the construction of solid brain maps? As vision writes spatial equations for the muscles to solve, cheiroscopic drawing is an interesting way to gauge the state of ocular motor ability and spatial vision. During cheiroscopic drawing, one’s visual system is completely stripped of contextual aids. Broader context often helps strabismics to get around and complete certain tasks by circumventing proper ocular motor movement or spatial vision and by relying on sub-optimal, monocular vision adaptations and other senses. When using a cheiroscope none of that is possible. Your drawing hand and fingers HAS to take its cues from the eyes. The movements of the hand are based on the movements of the eye. If the eyes are positioned well, move together in a smooth and harmonious manner and can maintain a steady posture, you will succeed. If not, you will come up with an inconsistent and skewed drawing. It’s that simple. A direct connection. No more adaptations, no more tricks, nowhere to hide from your visual shortcomings. It’s a head-on confrontation with your visual limitations but also an opportunity to improve and to chart and compare that improvement over time. I made a little, informative video about a cheiroscope that can be used at home. I apologize in advance for the constant movement of the camera. My video recording skills also need more work! Here are some more of my practice run results produced by using that device (March, 2015). They are each of them unique and contain small mistakes. 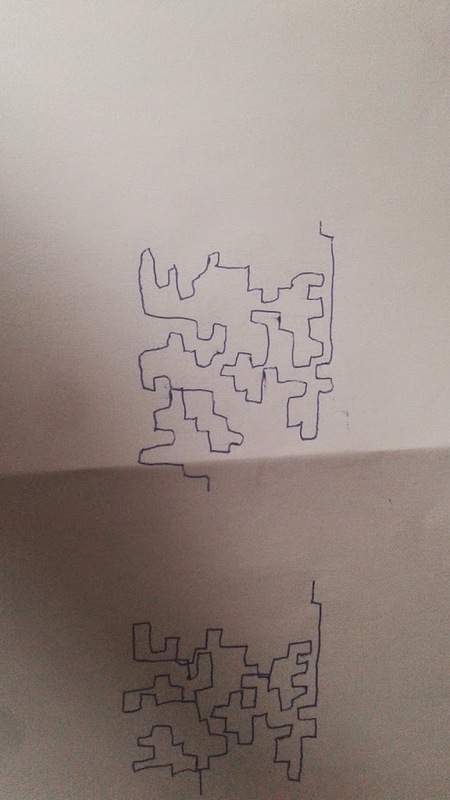 The variations in the drawings are variations in my vision and ocular stability. My vision is still volatile and unstable. Yet, it’s a far cry from where I’ve come from years ago. 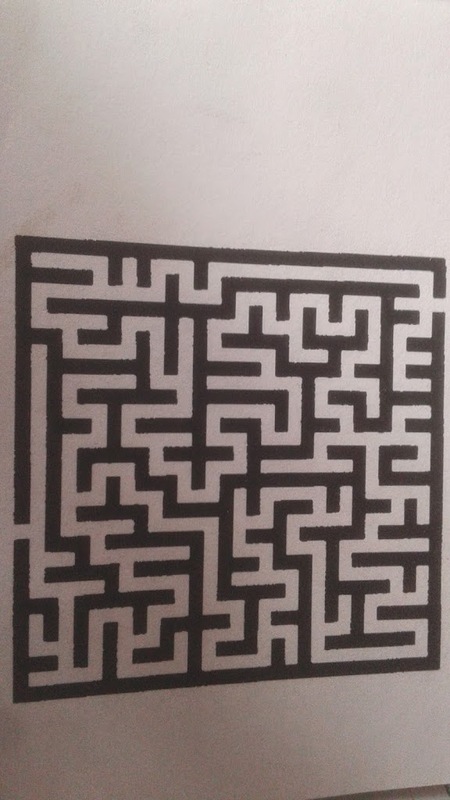 This maze is very detailed and requires a fairly sophisticated level of ocular control on which to base your solution. Merely being able to try this exercise is already a triumph for me. Let me show you where I’ve come from, going all the way back to February, 2011. For that purpose, I will be showing drawings made by me with another type of cheiroscope. This is a standup variation of the cheiroscope. It is called the Wolff cheiroscope named after Bruce Wolff, OD, who designed it. Recently, at the VT office, we were comparing some cheiroscopic drawings I had made over the years. 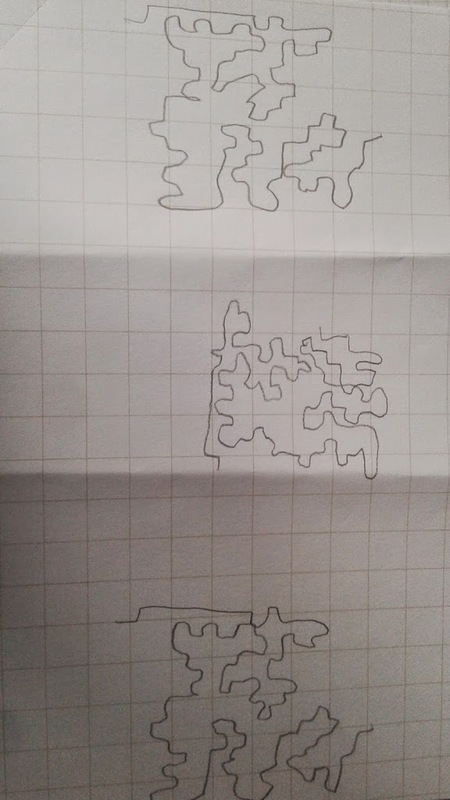 These pictures compare the results of the same cheiroscopic drawing exercise. The upper drawing was done on October 16th, 2012. The lower drawing was done on March 16th, 2015. 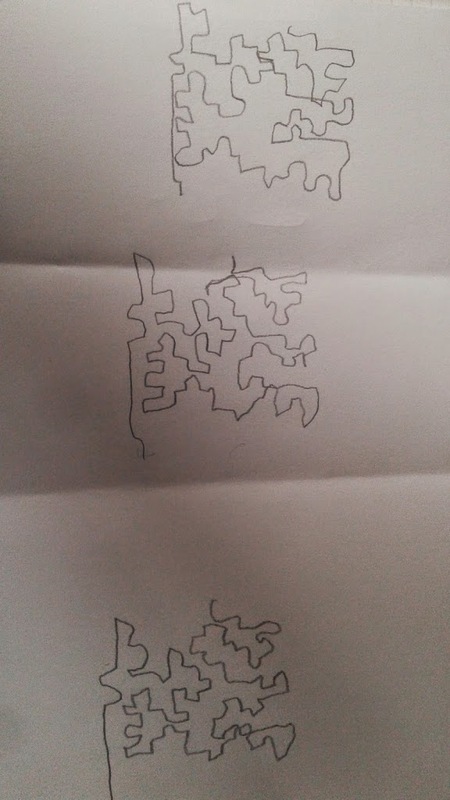 The relative position of the drawings is different because of different eye positioning. Also the quality of the drawing itself is markedly different because of improved ocular stability. 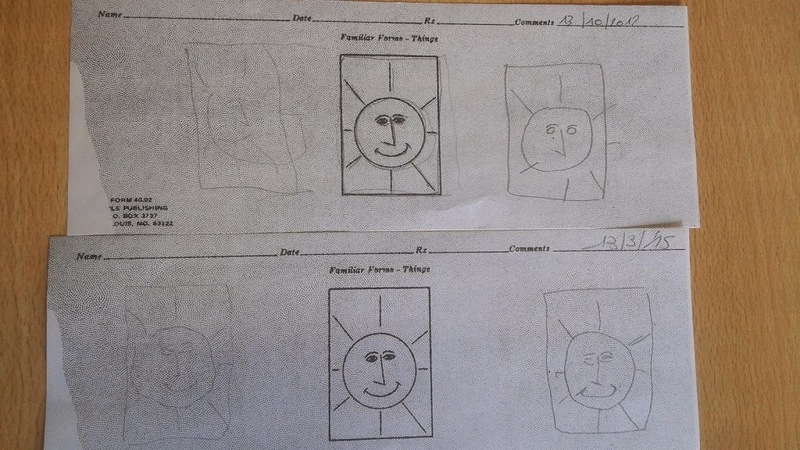 In 2012 the left hand drawing was so inconsistent that the sun wasn’t even staying her box. Hell, there was not even a clear box! And, as someone acutely pointed out, now the suns do have a smiley face! What’s even more startling is the fact that, on October 16th, 2012, I had already been in Vision Therapy for one year and eight months! 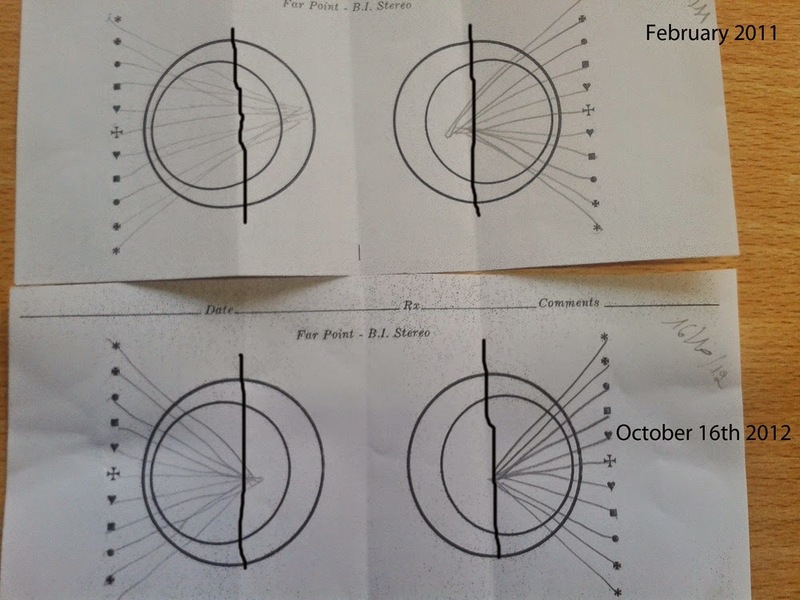 Here are two cheiroscopic “Van Orden Star” drawings comparing February, 2011 to October 16th, 2012. 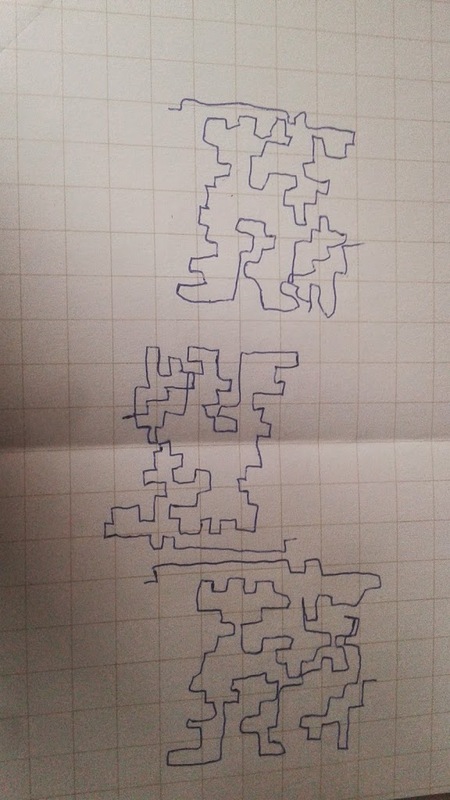 The drawn lines should converge onto the highlighted fold. In the first drawing, in 2011, this certainly wasn’t the case. I had a considerable vertical misalignment too. 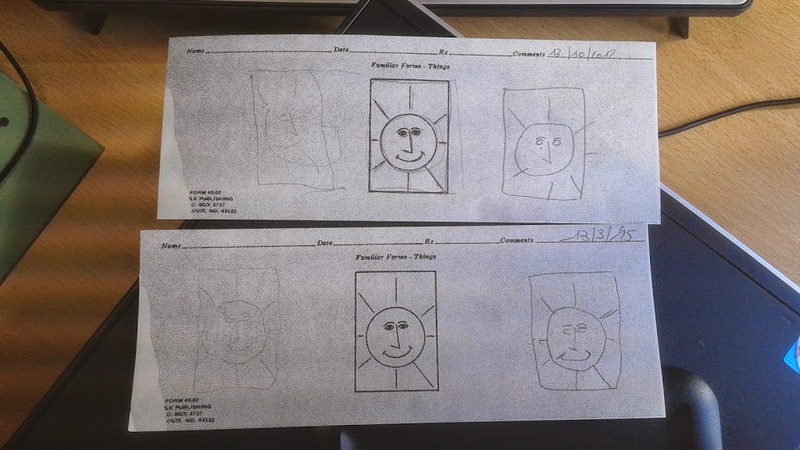 Notice that, in the picture with the sun drawings, the upper drawing was drawn on the same day as the lower Van Orden Star drawing. This nicely demonstrates that improvement is relative. On October 16th, 2012, I was delighted about my improvements regarding the “Van Orden Star” drawing. However, the more visually demanding and detailed sun drawing exercise left much to desire. Now, another two years later, the sun drawing too have improved significantly and I will continue to go down this road of more ocular stamina and accuracy. The only thing one can do is to consider his current vision status and keep on stacking incremental improvements to eventually get to a better place in the future. My primary vision therapy goal is not stereo vision. Stereo vision seems to be a combination of various basic vision skills. Overcoming the crippling legacy of strabismus surgery, which has thoroughly destroyed already ailing basic vision skills, is my primary vision therapy goal. To be specific, I need smooth tracking, reliable saccades and a stable vestibulo-ocular reflex. When I accomplish that, I’m golden. From what I hear, stereo vision will be a nice bonus on top of having these basic visual skills. These basic visual skills by themselves are pretty awesome too though! Without eye muscle surgery, I would already be seeing in stereo! However, as the cards have been dealt this way, these extra hurdles have to be taken. There is no other way. The only missing ingredient is more time and work. I can do that. The cloak of subdued dysfunction is slowly lifting itself. I have mentally prepared myself it might take until January 2017 for me to reach workable levels of vision. After six years, I think, this Vision Therapy thing will start to lose some of its charm. Hahaha. Cheers, everyone!